From the Fitbit app dashboard, tap the Account icon. If you're using the fitbit.com dashboard, click the gear icon. You'll see the last sync time right below the image of your Fitbit device. Our software is continuously evolving, and from time to time we need to break compatibility with old versions. We always maintain compatibility with the latest minor version. For example: After the release of version 1.9.0, the version 1.8.x will continue to function, and we will discontinue version 1.7.x and older. When you request a new link code on your device, the app informs its version to our system. If the version is outdated, the website will display a message like the one below during the link verification process. To ensure you have the newest version of an app on your device. 1) Plug the device into your computer USB. 3) Click the following link to open the list of Genius Wrist's apps. 4) Select the desired app. 5) Click the download button. 6) Wait for Garmin Express to finish the synchronization, and you will have the latest version installed on your device. In your watch, use the "Get Link Code" menu option. Go to Link Your App and input the code. Then return to your watch, run the app and use the "Online Sync" menu option to download your configuration. This situation happens when the app is first installed, or after you use the "Get Link Code" and do not input the code on the website. In these cases, the "Online Sync" will not recognize a valid key. The app is downloading the config and keeping it in memory, but it is not saving the configuration in your device, forcing you to get a new code and sync every time you start the app. There are two common causes for that, insufficient storage space or insufficient memory to execute the saving process. To address the insufficient storage space, clean up your device, remove that not used widgets, apps, and faces (use Garmin Express software on your computer, it is much faster than using the mobile phone), after that turn-off and on the device. Garmin Connect on Windows Phone is not capable of routing app requests to the internet. That means: Until Garmin changes the implementation of Garmin Connect software for Windows Phone, Windows Phone users won't be able to use Genius Wrist's apps since they require an internet connection. There is a topic on Garmin official forum about that. Do not worry; all your settings are stored on the website. Just generate a new LINK CODE in your device, go to Link Your App page and input the code, then do an ONLINE SYNC on your device to download your configuration. The maintenance of the Bluetooth connection between you watch and your mobile is not part of Genius Wrist's apps, it is an internal feature of your watch operating system. When the app displays the message "Phone Offline" it is just reporting the information the watch operating system is sending to it. Enabling the Bluetooth on your watch or phone does not mean there is a connection. A green dot indicates that your Garmin device is connected. A red dot signifies a connectivity issue and should be accompanied by a red banner with information on your My Day view. No dot signifies that your Garmin device is paired with your phone but is not connected*. Confirm your Garmin device is in Bluetooth range of the phone. Restart the phone and the Garmin device**. Rebooting each will typically solve most connection issues. Allow up to a minute for it to fully boot up, then open Connect Mobile and allow up to 30 seconds to connect. Proceed to step 3 if this did not solve the issue. Remove and then add the Garmin device back into Connect Mobile. Follow those steps by clicking here. This icon indicates that there is no device paired to Connect Mobile. Press this icon, select your device, and follow the instructions to add it to Connect Mobile. Confirm that the Garmin device is running the latest version of the software by connecting it to a computer and installing Garmin Express. Garmin Express will automatically check for and install any available updates. Confirm that your Mobile Device is running the latest version of iOS or Android. Consult your phone manufacturer for assistance if needed. Genius Wrist Apps do not connect directly to the internet. All apps depend on Garmin Connect App running on your phone to act as a bridge between your watch and the internet. ﻿Genius Wrist's website never generates some error codes, and they happen because of problems in Garmin Connect App running on your phone. The error codes 300, 104, 402 and 2 are some examples of error generated by the Garmin Phone app, not Genius Wrist's website. Error messages usually occur if you try to "get link code" or "online sync" while your device is transferring data to your phone like uploading activities, sending activity tracking info, etc. These transmissions are not related to Genius Wrist apps, but it seems that Garmin Connect App cannot handle multiple transfers simultaneously. Bluetooth connection instability can also cause this issues. Try rebooting your phone and your Gamin device. Various users reported the connectivity problems were solved after a successful device synchronization using Garmin Express installed on a computer. How to download workouts based on calendar? The system will assume the number of repetitions per set is the average number of reps defined to a specific exercise (minimum plus maximum divided by 2). The total volume of an entire workout is the sum of the volume of all individual exercises. This badge means you accumulated 5000Kg of training volume during the current month. The scoring system gives points based on perceived effort, not fitness level, that means, the easier the exercise is perceived by you, the fewer points you will score. If you do not measure your heart rate during the exercise your score will be very low. If you are about to report an error, be aware that the following information is essential to our team to reproduce the problem and fix the issue as fast as possible. Please be clear and concise without missing key points. Any lack of clarity leads to misunderstanding and slows down or prevents an analysis. - Explain the steps required to reproduce the problem. - Let us know if the error is repeatable. That means, it always occurs if you execute the same steps in the same order. - If an error occasionally happens after repeating the same steps, there is a good chance it is not an app error, but a device firmware problem or an out of memory issue. - If the failure occurs when executing a workout or immediately before or after it, provide its name so we can test it. - Log into your account and always report using the Genius Wrist's website contact form so that we can have easy access to your account setup and information about your device model. We always simulate issues on the same device model the problem was found. - If there is an app crash, the typical result is the app quitting unexpectedly or displaying an ‘IQ!’ icon but does not cause the entire device to crash or reboot. This kind of crash is most commonly due to a bug in an app, though it can also be due to a bug in Connect IQ itself or device firmware. Whenever an app crash occurs, a CIQ_LOG.txt file is written or updated to /GARMIN/APPS/LOGS on the device and contains information related to the crash that may be used to address the problem. After your first contact, our help desk team will provide instructions on how to submit this file to us. They typically cause the device to reboot or freeze and indicate a Connect IQ or device firmware bug. When a device crash occurs, an ERR_LOG.txt file is written to /GARMIN on the device, containing stack trace information related to the crash. Please provide this file when reporting a crash so that we can forward it to Garmin’s device teams. They can take a look at the logs to determine the cause of the crash. There is a minimal chance an app error produces this kind of failure. If the problem starts after a firmware update, you can be almost sure it is a firmware problem. Only Garmin can fix it this type of problem and they and will typically provide a fix in a future firmware release. The session recording is not part of Genius Wrist's apps. It is a function performed by the watch operating system itself. The apps only send commands to start, pause, resume, save or discard an activity. It is the watch operating system that is responsible for connecting to sensors, saving the activity file and sharing location to live tracking services. If your sensors are not displaying the correct data, if some information is not being displayed at the manufacturer website or if the live tracking is not working, you MUST contact the watch manufacturer support. The zone table used by the software to calculate the heart rate related data fields is the one configured in Gamin Connect web site. Your watch will automatically download your settings from Garmin's website. The following data fields are affected by the heart rate zone table setting. Heart Rate Zone - Number that indicates with precision your heart rate zone based on your current heart beats per minute. App installation/removal and download issues are related to Garmin App Store, Garmin Connect Mobile app running on your phone or Garmin Express app on your computer. Unfortunately, we cannot help you with that cause these functions are not part of Genius Wrist's apps or website. You will have to request support from Garmin to solve this issue. This app requires an update of your fenix 3. Please use Garmin Express to update your fenix 3. Will my activity session sync with Garmin Connect? All activity sessions recorded by Genius Wrist apps are sent to Garmin Connect. Session recording is not part of Genius Wrist apps; it is an internal feature of your device. The apps simply send commands to the watch to save, start, stop, discard or pause a session. The process of sending recorded sessions to Garmin connect is an automatic function executed by your watch, not by Genius Wrist apps. The "online sync" menu option inside Genius Wrist apps only download to your device the configuration that is stored in Genius Wrist website. Genius Wrist's apps calculate all data fields with information provided by the watch firmware; some require calculation and others are displayed exactly as informed by the watch operating system. Altitude, average cadence, average distance, average power, average speed, average pace, calories, cadence, heart rate, power, speed, pace, distance, timer, max cadence, max heart rate, max power, max speed, max pace, total ascent, total descent, temperature, total steps. If the HR is unstable, or if the speed or pace is erratic, if no distance or speed is displayed, it is not a failure in the app. It is your watch that is not calculating this information. Here is a list of details you must consider when using an app. - Be sure your heart rate strap correctly positioned. - Learn how to appropriately adjust your watch band for the best performance of your optical HR sensor. - Pay attention the limits and precision of your watch GPS and note its performance is affected by adjacent buildings and weather conditions. - Your device will not calculate calories expended without heart rate information. All other data fields are computed based on the data fields in the list above, so do not expect to have lap distance or lap speed if the device does not provide distance or speed. Run the Genius Wrist app you want to configure and then open the menu. Some apps will display the message menu disabled during a workout recording. In this case, you must first stop or discard the session before accessing the menu. To browse the menu options use the UP or DOWN keys, or swipe if you have a touchscreen device. That means you already logged on the website before. The password recovery and the resend email confirmation only work for local accounts. If you registered with Gmail or Facebook, you must use the same authentication provider to log in. The forgot password feature or email confirmation will not work in these cases. If you are sure you have a local account, then use the resend email confirmation or forgot password and check your spam inbox. Configure your profile at Garmin Connect's Website and set your time zone. (Upload Time Zone field). Why only 3 workout configurations? There are memory limitations in the devices and because of that the limit of simultaneous workout presets is 3. You can keep more configurations in Genius Wrist's website and swap them as needed. You can also plan your workouts with the training calendar, and setup your app to download your workouts based on the training schedule. vívoactive (NON HR) is not respecting the GPS disabled option. vívoactive devices (NON-HR) are keeping the GPS ON even when it is not selected. This issue started in firmware 3.50 and had been reported by Garmin itself. Until now, there is no comment from Garmin about a fix for this problem. It is required an external TEMPE sensor to use the temperature data field. Unfortunately, Garmin imposes this restriction. Connect IQ apps have no access to the internal temperature sensor. 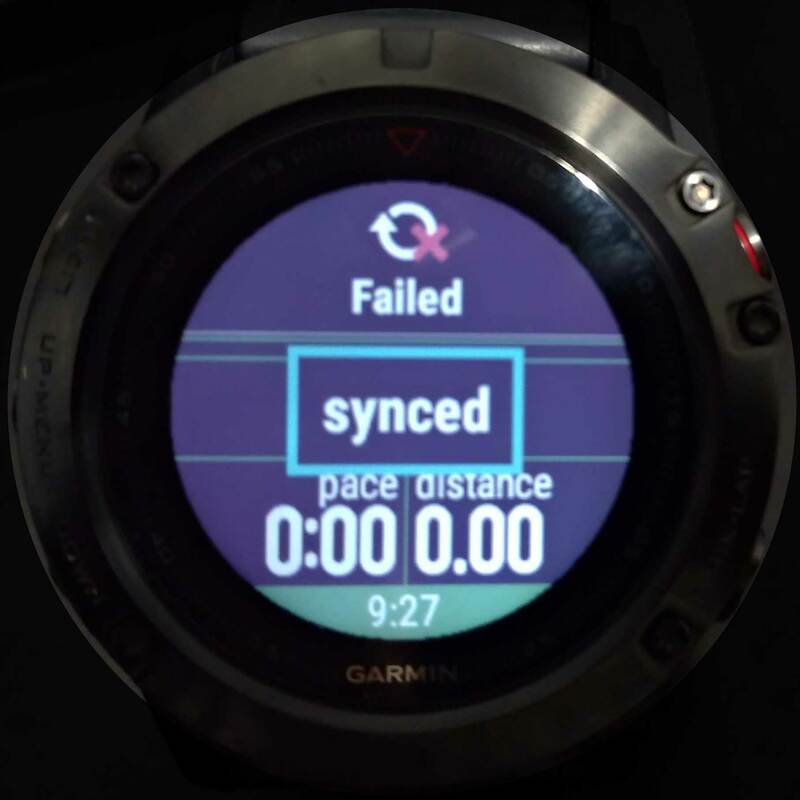 All Fenix 5 watches are displaying a "Failed" warning message at the top of the screen when an app tries to save the workout. 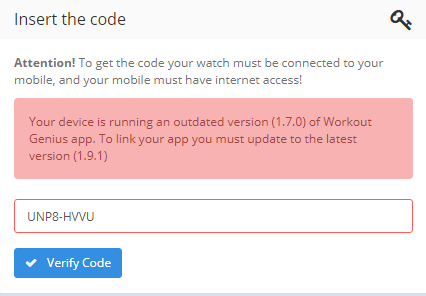 The error is not part of the Genius Wrist's apps; it is the watch operating system that is failing to send your workout to the Garmin's website. The message is annoying, but it is harmless since the watch will retry the upload some minutes later and it will succeed. As you can see in the image below, the app itself is successfully connecting (synced message) with the Genius Wrist's website and transmitting your workout information to the activity feed. The best productivity tool for your smartwatch. Structure your Gym, Yoga or Crossfit workouts. The easiest way to time your exercises. The super configurable, multi sport app from Genius Wrist. Set up structured workouts and let your watch guide you through the training.